The Indian elections are over and many are wondering why the Congress Party proved so popular with voters. One clear explanation is the appeal of the National Rural Employment Guarantee Act (NREGA) which every year offers 100 days work for all rural households. This act was introduced by the last coalition government led by Congress with the support of their partners including the Left Front. This photograph was taken in Shivpuri district in Madhya Pradesh, central India a couple of years ago. 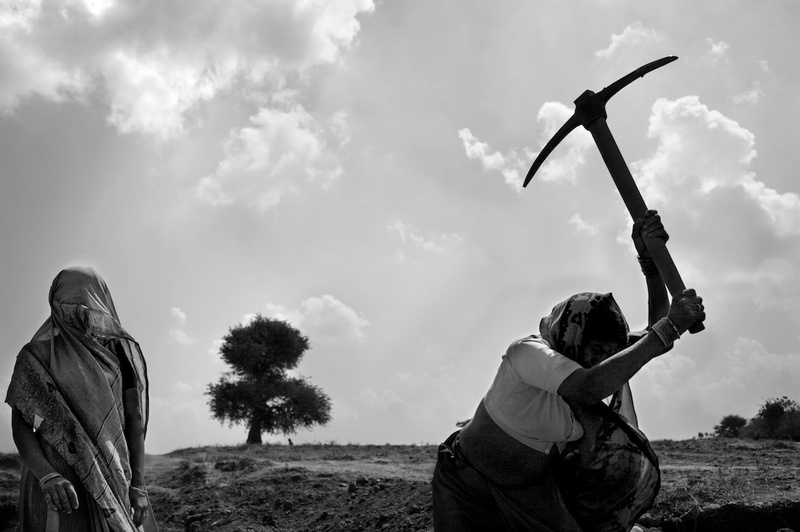 The woman wielding the axe is helping dig an irrigation pond as part of the NREGA. She is from a landless community and before the government provided her guaranteed employment, her only source of income was day-wage agricultural labour. Thanks to the NREGA, landowners are no longer the exclusive purveyors of work for the landless. The NREGA has suffered from administrative indifference and patchy implementation. But the scheme has at least begun to challenge the exploitative relationship that often exists between landowners and their landless neighbours… and in the process, helped win Congress a second term in office.